Winnebago’s small and spunky Type B Revel motorhome is designed to travel off the beaten path with ease, thanks in part to its four-wheel-drive Mercedes-Benz chassis with automatic traction control. 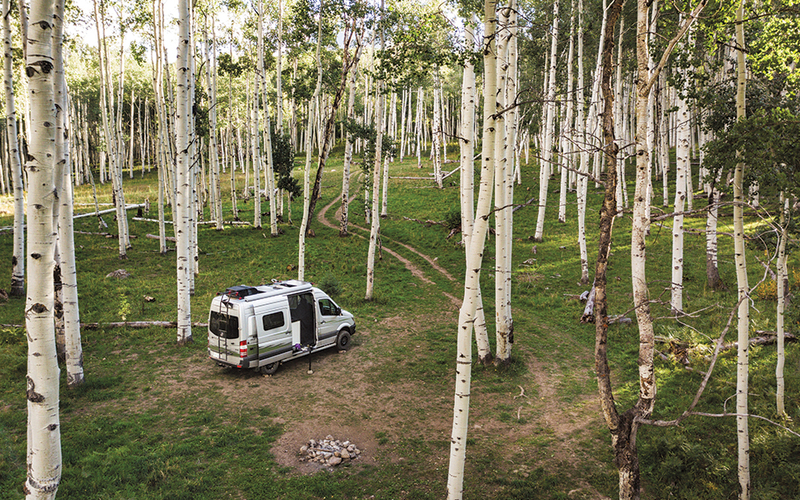 Built on a four-wheel-drive Mercedes-Benz Sprinter chassis, this Type B motorhome helps active outdoor enthusiasts to fulfill their quest for exploration and enjoyment. Winnebago introduced the Revel to meet the needs of RVers who have an adventurous spirit, those looking for a vehicle to take them to places unreachable in a typical motorhome. The Revel begins with a four-wheel-drive version of the Mercedes-Benz Sprinter chassis, which offers 8 inches of ground clearance for off-the-grid travel. This configuration makes the Revel equally at home in Utah’s Canyonlands, on the mining trails of the Colorado Rockies, at winter ski resorts, or along paved interstate highways. The Revel’s Mercedes-Benz Sprinter Chassis utilizes a 3.0-liter BlueTEC diesel engine, which has a push-button, on-demand four-wheel-drive system that features automatic traction control in low range. A 5,000-pound Class III trailer hitch allows occupants to tow a decent-sized trailer, add a bike rack, or take along other toys. The Revel test unit was fitted with the optional, aggressive BFGoodrich T/A K02 tires, size LT245/70R17. They were mounted on Method race-style alloy wheels with an attractive satin-black anodized finish. A Mercedes-Benz five-speed automatic transmission delivers the power to all four wheels. The exterior of the Revel test unit featured the Silver Forest paint scheme, one of two available choices, and included vinyl graphics. The other paint choice is Pebble Gray. The Revel also is available without graphics for those who want a more subtle appearance. The chrome grille sports the Mercedes-Benz logo. The running boards are equipped with ground-effect LED lighting. A 10-foot power awning with LED lighting adorns the patio side of the motorhome. Winnebago designers replaced the usual windows on the rear flanks of the Sprinter chassis with custom fiberglass panels that increase the width of the rear of the motorhome. This allows for a nice-size sleeping and cargo area. 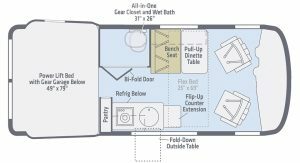 The Revel 44E floor plan is designed to meet the needs of RV owners who want to experience outdoor adventures beyond the campground. For this reason, the Revel 44E sports changes and features not found in traditional motorhome floor plans. For starters, since this four-wheel-drive motorhome takes travelers to places where they are most likely to track mud, sand, or snow into the vehicle, an easy-to-clean interior is important. The nonskid, weathered-gray vinyl flooring meets that criteria. It sheds mud and water and prevents slipping on a wet floor. The Winnebago Revel test unit included a 2.5-cubic-foot compressor-driven refrigerator. The test coach had the Kool Kiwi (green) cabinetry color, with black and white accents. A second cabinetry choice is Silver Springs (gray). 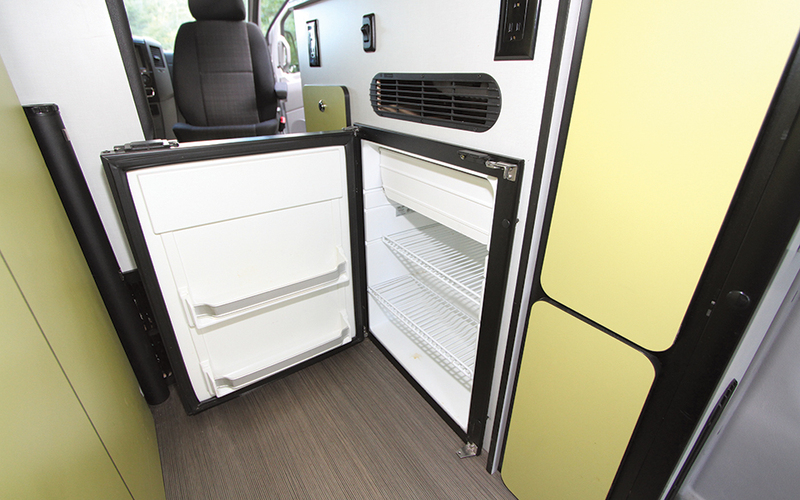 All cabinet doors feature push-button latches to keep them securely closed during off-road travel. LED lighting throughout the coach minimizes electrical usage. Dual-pane acrylic Euro-style windows feature a deep tint. They can be opened for ventilation, even in the rain. The side and rear doors also can be opened to allow for airflow, and snap-in door screens help to keep insects outside. The cockpit seats can swivel to face the rear when parked, and they also recline. The standard Mercedes-Benz cockpit arrangement includes an in-dash entertainment system that doubles as a monitor for the rearview camera. Power cab windows and door locks are standard, as is a blind-spot warning system and collision prevention assist. The Winnebago Revel test unit included cockpit seats that swivel to face the bench seat behind them. Behind the two cockpit seats is a short bench seat. This seat is equipped with seat belts and can be used during travel; however, it may not be all that comfortable for two full-sized adults for any long distance. A small pull-up table folds into position for use as an eating surface or to accommodate a laptop computer. Swiveling the front seats to face the rear forms sort of a booth area with the bench seat. The dinette converts to a cross-coach sleeping space for a guest. 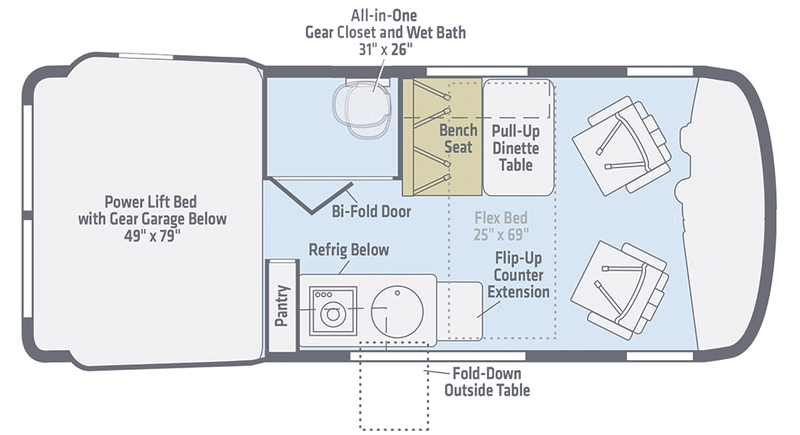 The galley is a major departure from those found in motorhomes designed primarily for campground use. A single-burner induction cooktop is located in the laminate-covered galley counter, immediately next to the Dometic stainless-steel single-basin sink, which has a hinged glass cover and a folding faucet. The sink drains to a 21-gallon gray-water holding tank via a drain pump to keep the water usage to a minimum. Numerous drawers and cabinets offer an excellent amount of storage space for a coach of this size. 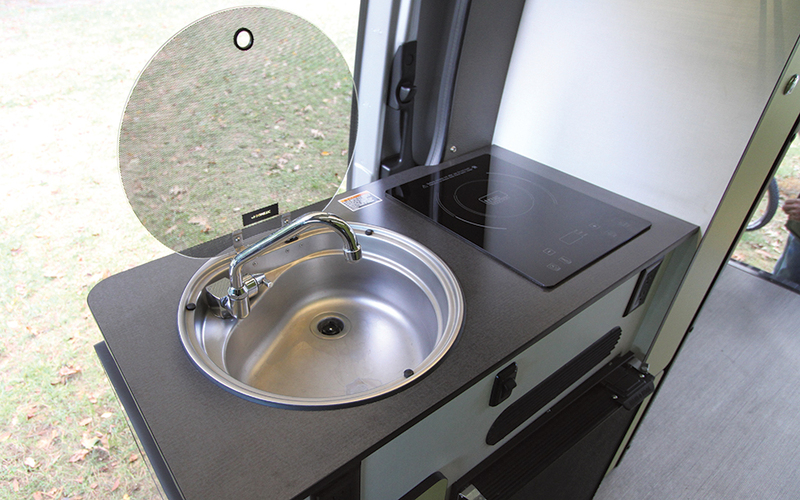 The Winnebago Revel test unit included a stainless-steel sink and a single-burner induction cooktop. The refrigerator is a 2.5-cubic-foot compressor-driven model that allows for safe operation at the extreme angles likely to be encountered when traveling off-road in this motorhome. The refrigerator is located beneath the galley counter and next to the pantry. No built-in microwave is included, but a tabletop microwave can be used if you bring along a portable generator or have access to shore power. A flip-up counter extension offers additional galley work space when needed, but the real treat is the fold-down exterior table. With the side door open, the backside of the galley is exposed. The fold-down table can be deployed and supported by a removable leg. Simply press the switch to extend the awning, and you can enjoy your bacon and eggs outdoors. If the mosquitoes get too bad, you can always close the door screen and move inside. A power roof vent ensures adequate ventilation in the galley area. The multipurpose wet bath is designed to offer the most usable room in the least amount of space. At 31 inches by 26 inches, it is relatively sizable. With the teak wood shelves in place, it can be used as a storage locker for gear. It comes equipped with a power vent fan designed to help dry out wet gear as needed. Pull out the shelves and it can be used as a shower. The bath comes with a removable plug-in showerhead and hose that snaps into the quick-disconnect fitting on the wall. (This same showerhead can plug into a coupler body on the backside of the galley to rinse dirt off of coach occupants or gear.) A bamboo shower mat is included. The cassette toilet swivels 90 degrees to allow use in two different directions. 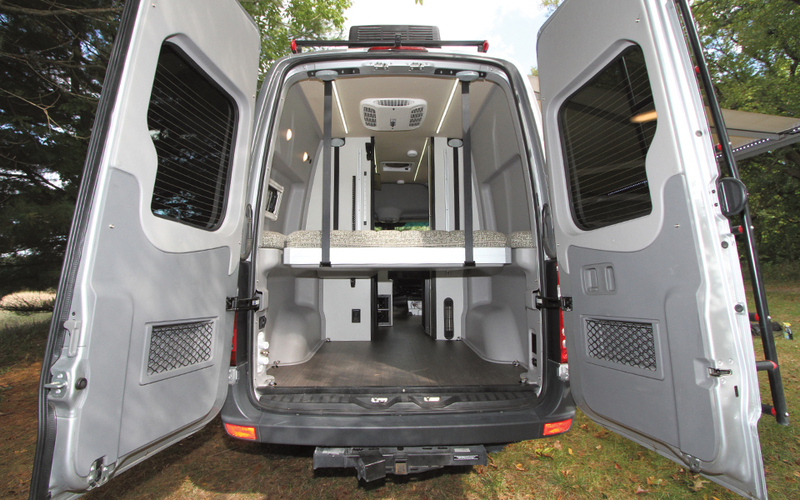 The Revel’s rear doors swing open for ventilation or full access to the interior. The rear of the coach doubles as cargo storage and sleeping space. As noted, Winnebago removed the standard rear side glass from the coach and installed custom panels that increase the width of the unit. These panels blend well with the exterior of the coach and actually add a slight bit of “attitude.” The added width also allows for the installation of a power lift bed in the rear. This bed measures 79 inches long by 49 inches wide and can be stored at the ceiling when not in use; it lowers to a comfortable sleeping height at the press of a button. 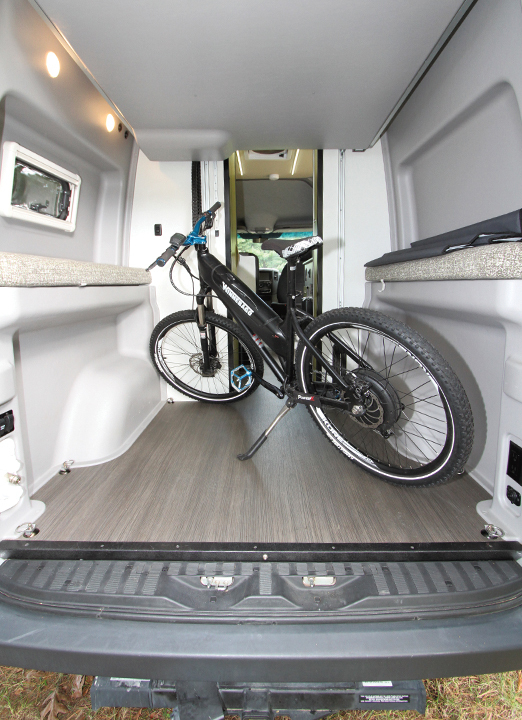 Even with the bed deployed, considerable room for cargo storage exists beneath it. 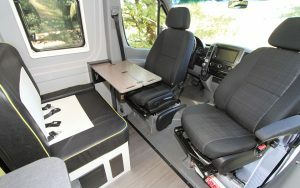 With the bed in the raised position, the entire rear area is available for cargo. A window in this area allows for airflow on the driver’s side of the bed. A third quick-disconnect faucet is located at the rear of the RV, making it possible to use the showerhead to wash off muddy gear before storing it in the garage area. 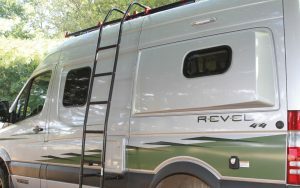 Since the Revel is intended for use in remote locations, its utilities also differ from those of traditional motorhomes. An Espar 17,000-Btu hydronic heating system supplies warmth for the motorhome, as well as instant, unlimited domestic hot water for the sink and shower. Our test unit was equipped with an optional 13,500-Btu roof-mounted air conditioner. A 30-amp detachable power cord provides 120-volt-AC power from a campground pedestal or a portable generator. Three 12-volt Group 31 deep-cycle AGM batteries handle all of the 12-volt lighting and accessories, as well as the water pump. The batteries also power a Magnum CSW Series inverter, which provides 120-volt-AC power at the various receptacles, as well as power for the refrigerator and the induction cooktop. The Revel has no onboard propane. 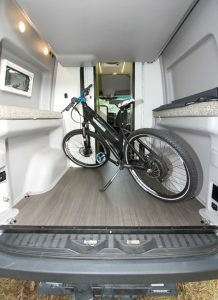 Nonskid vinyl flooring throughout the motorhome facilitates storing toys and other outdoor gear. The Revel also has no televisions, as it is assumed that many owners will want to stream their video content. To that end, 120-volt-AC and 12-volt-DC power outlets are located inside and on the exterior of the RV. Two solar panels on the roof provide free battery charging power whenever sunlight is available. The solar electric system is monitored via a charge controller display panel inside the RV. The 21-gallon fresh-water tank is filled via a connection on the backside of the galley island, which is exposed when the side door is open. The plumbing system is designed in anticipation of the vehicle being used for winter adventures in freezing temperatures, and having the fresh-water fill inside the door keeps it in a heated area to prevent freeze-ups. This design also precludes using continuous water from a campground spigot. Instead, campground water can be used to fill the fresh-water tank, which then feeds the motorhome’s fixtures. The 21-gallon gray-water tank can be dumped via a driver-side control. 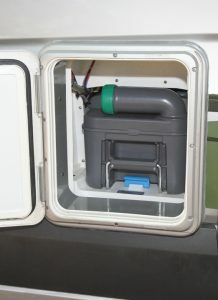 The 5-gallon cassette toilet reservoir is located in a compartment on the same side of the motorhome. This cassette can be taken to a dump station or to a place where direct burial in the ground is allowed. The cassette design eliminates the need for a black-water tank and helps to conserve water usage. 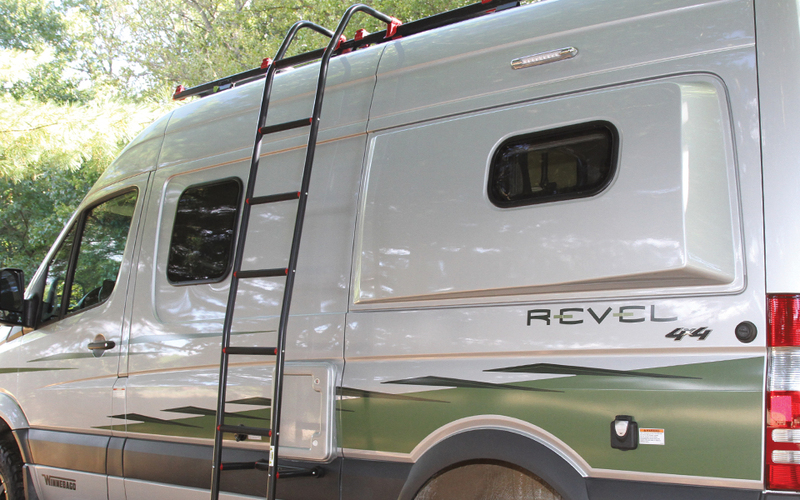 The ladder on the Winnebago Revel affords access to the roof cargo rack and can be relocated where needed. Driving the Revel was easy, and the coach handled well on paved roads. With the roof cargo rack up top, I expected to hear a fair amount of wind noise, but I found it to be amazingly quiet. When it came to off-roading, the chassis was equally impressive, and we found brush busting through narrow wooded lanes to be effortless and comfortable. The four-wheel-drive system puts the traction down when needed, and the optional BFGoodrich T/A K02 tires had a tread pattern that was aggressive enough for off-road traction yet not noisy on the highway. A removable five-gallon cassette toilet, accessible from an exterior compartment, eliminates the need for a black-water tank. The motorhome is designed for use in areas without shore power or fresh water availability. Various water-saving features are employed, including on-demand water heating. A momentary switch that needs to be held to drain the galley sink discourages leaving the water run wastefully while rinsing dishes. The cassette toilet also uses no water. Electricity is another area where conservation is the goal. The three deep-cycle house batteries can be recharged via the engine’s alternator, via the solar panels, or by plugging into shore power or a portable generator set. The refrigerator and cooktop can run off the inverter, so running a generator is not required. If the Revel is equipped with the optional roof air conditioner, you will need external power to operate it, because it consumes too much power for the inverter and batteries to handle. If you are a true adventurer, you may decide to skip the optional air conditioner, which also will provide added rooftop cargo space. Obviously, the Revel isn’t designed for the typical motorhome owner; however, for those who want to venture off the beaten path and explore in more adventurous surroundings, this environmentally friendly RV merits serious consideration.